One method for finding exoplanets is to look for planetary transits: if the system is well inclined, the planet will pass in front of its host star, causing a ‘mini-eclipse’ and reducing the host’s brightness for a short period of time. Using this method, the Kepler Mission searched for transiting exoplanets by monitoring over 145,000 stars in the span of four years, searching for periodic drops in brightness. 1,039 Kepler planets have been confirmed, and the team has released a list of 7,557 ‘Kepler Objects of Interest’ (KOIs). This data release includes all candidate planets, even if the data isn’t good enough to confirm whether the system actually includes a planet, or whether something else is affecting the brightness (ex. a sun spot or a background binary system). Transiting planets are much easier to spot if they are closer to their host stars: the planet is more likely to pass in front of the star during its orbit, and if it does it will block a greater fraction of the light. Since a close planet will also have a shorter orbital period, transits also occur more often, increasing the robustness of the detection. As such, the majority of the known transiting exoplanets orbit their host at least every 10 days. In today’s paper, however, the authors are focusing on planets beyond the snow line: wide orbit gas giants, far enough from the star that temperatures have dropped to the point where water and carbon dioxide freeze. This is largely unexplored territory, with only a handful of planets at large separations having been detected by the radial velocity and direct imaging techniques. Transit detections at these separations would provide a measure for the planetary radius, and even the possibility for atmospheric characterization of the planet. So, how might one go about finding them? The authors of today’s paper suspected that the standard Kepler pipeline might miss so-called Single Transit Events (STEs), where a planet transits only once in the entire duration of the Kepler mission. An STE by nature can’t be detected by looking for periodic signals, so the team visually examined every single light curve for every single KOI, searching for unexplained dips in the data. The KOIs were chosen for a couple of reasons. First, planets in the same system tend to be lined up. If the nearby planet is inclined just right for a transit to occur, a further out one might be, too. Secondly, to calculate orbital properties a star density is needed: in a system with other planets present, this is already calculated, and so there are fewer free parameters. Bearing all of this in mind, the team found a total of 28 STE, in 24 systems, each lasting between 7 and 40 hours (I’m going to remind you at this point that there are 7,557 KOI light curves, each lasting ~30,000 hours, so I don’t envy whoever got roped in to doing that job!) The curves can then be modeled to extract information about the orbital periods and radii of the planets using the ‘total transit time’ (the total time the star is dimmed) and the ‘full transit time’ (the total time the planet is fully in front of the star and the star is at its dimmest). Of the 28 events detected, the authors rule out 12 events which they believe are clear false positives. The remaining 16 STEs (in 14 systems) are split into three categories. Two example Single Transit Events (STEs). In each case, the total transit time (all the time the star is dimmed) and full transit time (all the time the star is at full transit, i.e. maximum dimness) can be used to calculate total orbital period and the planetary radius. The Good: 7 of the candidates are highly likely to be real planets. One particularly interesting target is KOI-847, for which two events were observed ~1100 days apart. Since these light curve events share similar properties, the authors predict they are the same planet. This is a great proof of concept for the technique. The Bad: Two events (both in the same system) were found to have a radius far larger than a planet could be. The authors believe this target is an eclipsing binary. The Ugly: For 6 of the candidates, the periods derived from the light curves are less than the calculated “minimum Kepler period” – the minimum time necessary for a planet to exhibit only one transit in the entire Kepler mission lifetime. These could be false positives – but since the period is calculated assuming a circular orbit, they could also be highly eccentric planet and have much longer periods. The authors note that they found a gap between the inner and outer planets. This is similar to the distribution of planets in the solar system – but is probably not a real effect. Even a tiny change in inclination for a far-out planet will make it undetectable, meaning only one of the far out planets is likely to be seen in any one system. To test this idea, the authors simulate a large number of systems with uniformly distributed planets, and test which of the planets are detectable using the transit method. For the systems where the furthest out planet is detected, a gap is often observed, even though this wasn’t present in the simulated system. As such, there is not yet enough evidence to make any comment about this gap. Left: Distribution of planets for the seven observed systems. There seems to be a systematic gap between the close-in and long-period planets, but this is probably not a trend because we are less sensitive to the far out planets. Right: A model system with uniformly distributed planets (top row) is simulated and detected planets displayed. For systems where the widest-separation planet (red column) is seen, the inner planets are almost always observed while the wider ones are often missed, meaning that even this uniform system would appear to include a gap, as was observed in the paper. Another interesting consequence of this work is a (very very tenuous) estimate of how many stars host planets beyond the snow line. The number of observed planets can be calculated from the orbital period, the mission duration, the number of systems observed, the probability of observing a transit if a planet exists, and the average number of planets per system. All bar the last two can be calculated, and by approximating the likelihood of a transit, the average number of planets with periods over 1000 days is determined to be ~0.2. In other words, every fifth star should have a long-period gas giant. 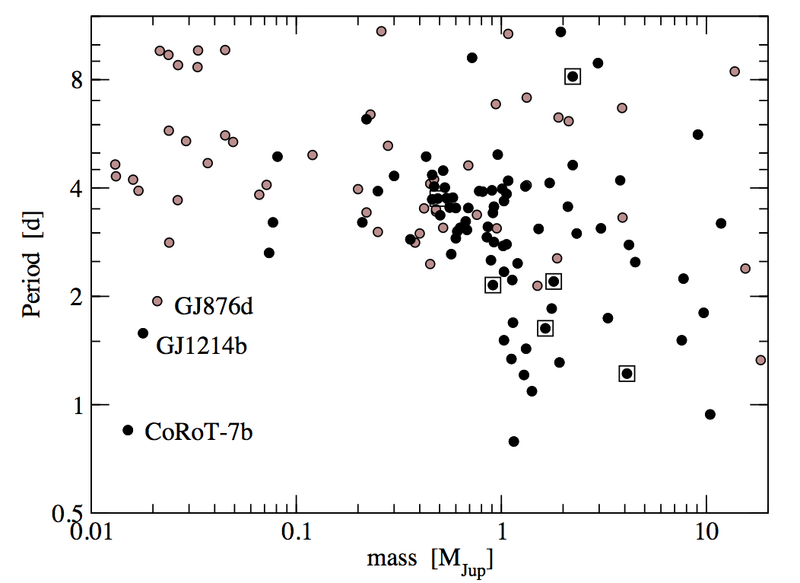 It’s worth noting that this is very much small number statistics – we’re extrapolating from just seven candidates to the rest of the universe – but as someone who’s trying to directly image wide separation planets for my PhD, its reassuring to know that there should be stuff out there for us to find! An excellent astrobite, Elisabeth! Very helpful. Many thanks! Fun example of what can be found in a data set if you have imagination and determination. Very enjoyable.